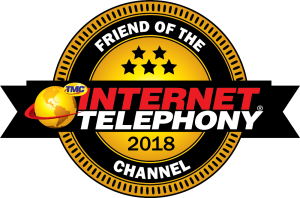 LOS ANGELES, CA — November 27, 2018 – AireSpring, a leading Managed Services Provider of Cloud Communications and Managed Connectivity Solutions, today announced that they were named by TMC as a winner of the 2018 INTERNET TELEPHONY Friend of the Channel Award, presented by INTERNET TELEPHONY magazine. The award recognizes vendors who have unique attributes that drive channel success. AireSpring was acknowledged for being the “Most Supportive” vendor within this crowded market. AireSpring, which is 100% channel focused, sells exclusively through master agencies, independent sales agents, VARs and MSPs, and places a heavy focus on helping its partners succeed. “We pride ourselves in providing white glove, concierge service, superior back office tools for real-time quotes and order tracking, and one of the broadest and most competitively priced product lines in the channel,” stated Ron McNab, AireSpring’s senior vice president of channel sales. “Additionally, we help our partners keep their knowledge skills up-to-date through monthly webinar trainings,” added McNab. “My team and I don’t just manage from behind our computers, we are on the road weekly meeting face-to face with our channel partners to hear what they have to say and to help them succeed in any way possible.” AireSpring remains a channel-driven organization, and is firmly committed to offering our channel partners award-winning products along with industry-leading evergreen commissions and SPIFFs. AireSpring has received numerous industry awards for “Next-Gen Solution Provider,” “Top Midmarket Vendor Executive,” “Product of the Year,” “Best Telecom Deal,” “Best in Show,” and “Top Channel Program.” AireSpring is privately held, diversified, debt-free, and renowned in the industry for delivering a broad range of innovative cloud communications and connectivity solutions at competitive rates, with white glove service that extends throughout the entire customer lifecycle. To find product information or to become an AireSpring partner, please visit www.airespring.com or contact us at (888) 389-2899. Through education, industry news, live events and social influence, global buyers rely on TMC’s content-driven marketplaces to make purchase decisions and navigate markets. As a result, leading technology vendors turn to TMC for unparalleled branding, thought leadership and lead generation opportunities. Our in-person and online events deliver unmatched visibility and sales prospects for all participants. Through our custom lead generation programs, we provide clients with an ongoing stream of leads that turn into sales opportunities and build databases. Additionally, we bolster brand reputations with the millions of impressions from display advertising on our news sites and newsletters. Making TMC a 360-degree marketing solution, we offer comprehensive event and road show management services and custom content creation with expertly ghost-crafted blogs, press releases, articles and marketing collateral to help with SEO, branding, and overall marketing efforts.